Sometimes a bride will want to be a little less formal on their wedding day. Most wedding boutiques have more full length wedding gowns. But what if you want something a little different? Well we have three informal short wedding dresses for you. These and many more are available at Cutting Edge Brides Wedding Boutique based in Bexley. Sofia is a beautiful striped tea length short wedding dress with a difference. The stripe in the Tulle is accentuated on the fitted bodice and at the back where it dips to reveal the stripey tulle and button back detail. The soft flowing skirt has a pretty scalloped edge around the bottom and the waist is finished with a neat bow on the front. 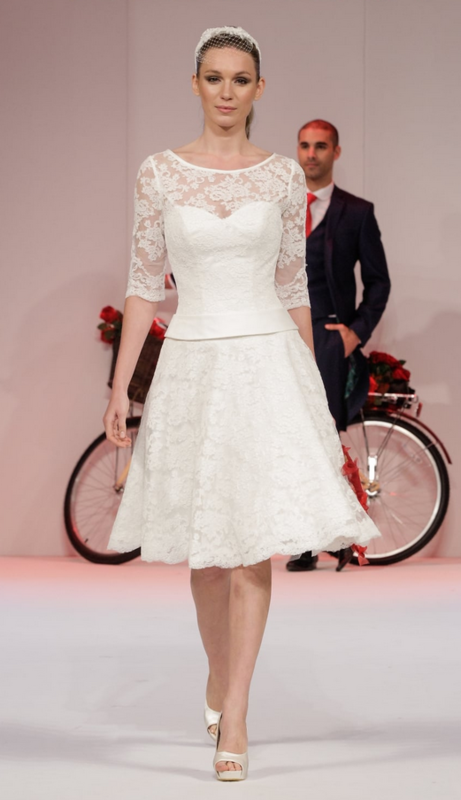 This is a lovely alternative short wedding dress that you can dress up or down depending on your style. The Rita Mae collection are designed to be worn on the big day and afterwards. They are a celebration of timeless dresses that a bride can treasure forever. This wonderful chic tulle tea length wedding gown has a deep plunged v neck bodice. The cap sleeves are tulle with encrusted beading which gives it a vintage inspired feel. The beading cascades onto the bodice and full tulle circle skirt. It’s a very pretty and informal short wedding dress and very unique for any bride looking for a more relaxed look. True Bride created a dedicated collection of sassy tea length wedding dresses with a retro feel. This vintage inspired collection of short bridal gowns features details from the 1950’s such as satin collars, sheer sleeves and circular skirts, perfect for dancing in! Brighton Belle by True Bride can be ordered in any size, length and some styles are available in range of beautiful colours. Mae is a beautiful lace tea length vintage inspired wedding gown with a dropped waist. The lace sleeves are a flattering half length with a slight scalloped edge. Again this dress has elements of a classic wedding dress but with a modern twist that can be dressed up or down. This scalloped edge is also on the bottom of the 1950s style lace skirt. A dropped waist takes the eye away from the waist area and lets you focus on the legs or bodice. So a great option if you feel conscious of your tummy area. Timeless Chic is Cutting Edge Brides exclusive designer brand. It is unique to the boutique and it is made up of an exquisite collection of vintage inspired bridal gowns. The gowns are lovingly hand-finished to the highest standard. If you want to find your perfect informal short wedding dress we would love to help. All our appointments are one to one to allow us to focus on you and your wedding dress. Book your one to one appointment today. Why not also visit our Facebook page and Pinterest boards for more inspiration and tips for getting the most out of your wedding day.